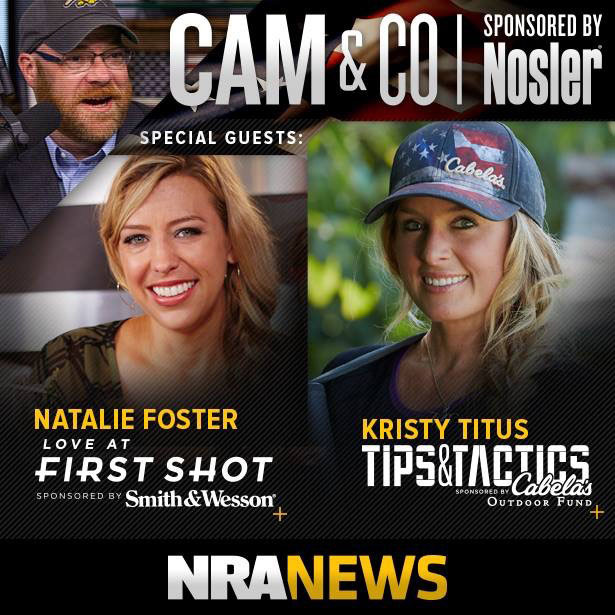 NRA News- Cam & Co.
Cam & Co is a three-hour news-talk show featuring in-depth interviews with NRA leaders, newsmakers, politicos, journalists and congressional leaders. Plus commentary and analysis you won't find anywhere else. Kristy Titus is an NRA Certified Refuse To Be A Victim and Basic Pistol Instructor. The Cabela's Ambassador is also featured on Tips & Tactics, sponsored by Cabela’s Outdoor Fund. The Kristy Titus series includes a total of six episodes, with “Bolt-Action Rifle Fit” premiering today, Thursday, September 24. She explains the importance of manufacturers paying attention to scale for shooters, aiding accuracy and control for both men and women. Click here to watch Kristy's segment. Tips & Tactics, sponsored by Cabela’s Outdoor Fund, Thursdays on NRA News. Originally aired on Cam & Co 09/24/15. Full Draw Full Time Podcast is here to bring you people and stories of Western Bowhunting. Join South Cox of Stalker Stickbows and Kody Kellom of Full Draw Film Tour, as they live life at Full Draw! Whether it is topics of DIY adventures, preparing for the backcountry, calling elk or spot and stalk hunting, we will bring you interesting guests and incredible insight. If you bowhunt the West for Elk, Mule Deer, Blacktail Deer, or anything you can chase with a tag, you better sit tight and enjoy the ride. Hunting the backcountry can put your body through some rigious demands. This episode we have Kristy Titus teaching us about food and nutrition. With her breakdown, you can properly fuel your body to be successful while out in the field. Listen in and enjoy this epidsode of Full Draw Full Time. During the 'TURNING POINT', Kristy brings a learing lesson from a preventable mistake she made in the field. This segment is brought to you by: goHUNT.com Sign-up today as an 'INSIDER' and use PROMO CODE: FULLDRAW to get a free $50 gift card. On June 26th, I sat down with RL Garrigus of KSJJ 102.9 radio in Bend OR and discussed my May hunts with Wounded Warrior Outdoors and Milligan Hunting for black bear. We also discussed the upcoming season 3 of RMEF's Team Elk television show. It's is always a pleasure to sit down and talk hunting with RL. On March 18th, I did a LIVE radio broadcast in part with Tim Campbell, the RMEF Pendleton Chapter Chair discussing the upcoming banquet and fundraiser and helped to promote the banquet and the youth elk hunt that was to be auctioned off. On March 18th, I sat down with RL Garrigus from 102.9 KSJJ Radio, serving all of Central Oregon and talked about the Rocky Mountain Elk Foundation Elk Camp in Las Vegas NV, the upcoming RMEF Pendleton OR Chapter Banquet and the RMEF Central Oregon Chapter Banquet. On December 20th, I sat down with RL Garrigus from 102.9 KSJJ Radio, serving all of Central Oregon and talked about Christmas traditions, fond memories, and what is on my Christmas list for Santa this year. Be sure to tune in Central Oregon. On November 30th, I did an interview with Jack Borcherding of the Oudoor Report Radio show, seving Oskaloosa Iowa and surrounding area. During the interview we discussed how I got involved in the outdoors, the companies that I serve such as the Rocky Mountain Elk Foundation, Team Elk, Cabela's, Swarovski Optik, Under Armour, Realtree and the publications that I write for Elk Hunter Magazine and Western Hunter Magazine and what it means to me personally to be to be able to serve as a female ambassador for those companies all while helping to ensure the continuation of our hunitng heritage, conservation of wildlife and habitat.